Today I went to see a doctor (not my favourite exercise) to check out my ankle. I sprained it tripping on nothing on a dry indoor floor two weeks ago while on a trip to the glasses market. She doesn’t think there’s anything major wrong, but gave me some great Chinese medicine patch things to wear on it. A few hours after starting with it my ankle is actually feeling a bit better. Incidently, the trip to the glasses market (a trip I’d put off for 18 months) was quite successful, resulting in four pairs of nice glasses. I am so pleased with the new prescription – I knew my astigmatism was getting worse, but I didn’t realise how bad it was til I put on the new glasses and could SEE! Anyway, I took a cab straight from the doctor up north for youth group. The doorman at the building asked me to wait a few minutes, that there were no cabs right now. After a minute, he seemed to get an idea, and went over to a taxi parked just to the side, told him where I was going and asked if that would be okay. The driver quite happily said, sure, that would be perfect. Having overheard, as I got in I asked if my destination was convenient for him. He said yes, very convenient; he was waiting for a fare to the airport, and since I was going most of the way there it was perfect for him. Occasionally I meet a driver who has interesting things to say, and a good attitude, that makes it fun to listen and learn from him. This was certainly one of those times. The fluency of that first little bit of conversation led to half an hour more of it. Let me point out now that this post records the opinions Driver Zhao offered, and I certainly don’t share all of them! But I’m always interested to learn more about another person’s perspective on life. As we drove off Driver Zhao asked whether I understood why he was waiting at a hotel. He explained that if he waits at a hotel, sooner or later someone will want to go to the airport, which is the direction he wanted to go. Driving around on the street, he would have to pick up anyone who waved him down and go where they wanted, whether or not it was what he had planned. While he enjoys foreigners in general, he said there’s one exception – black people. Insert sigh. I’ve heard drivers say nasty racist things since my first year here, and I generally respond with something heated about how many wonderful African friends I have in China. This driver answered without anger, simply telling a story of how once, when arriving at an African passenger’s destination (Sanlitun), the man patted down his pockets as if going for a wallet, then dashed off without paying. I still dislike the generalisation, but at least he didn’t start lecturing about how all black people are bad. I’ve heard that rant far too many times and it makes me so angry! Driver Zhao enjoys meeting people from other places. He likes being helpful to people who are new to Beijing, to those who haven’t visited their nation’s capital before. He particularly mentioned teaching people to not litter, saying “don’t throw that away here/there, see there is a rubbish bin over there, I’ll even drive you up to it”. He contentedly told me how they would thank him for showing them, saying that they would now know for next time. He also shared a more negative story. One time he saw two men he described as being from outside Beijing (not sure how he knew) beating a woman by the side of the road. He was shocked – this was so not okay – and pulled over to get out and make them stop, but with words, not fists. Their response was to turn on him and start beating him up. As a former soldier, though, Driver Zhao knew how to defend himself. Still, the fight lasted ten minutes. Despite having served as a soldier, Driver Zhao doesn’t believe in war. War is never a good solution; regardless of who wins, both sides suffer. In war, he said, it is the poor people who die – whether the army in question is China’s, Japan’s, or perhaps even America’s. It is the poor families whose children go to war; a president’s child will never be on the front lines. When he hears people say they want a war (the implication being a referralto recent problems with Japan) Driver Zhao tells them to go visit a rural area on qingmingjie*; once you’ve seen all the grandparents taking their orphaned grandchildren to visit the parents’ graves, THEN say you want a war. 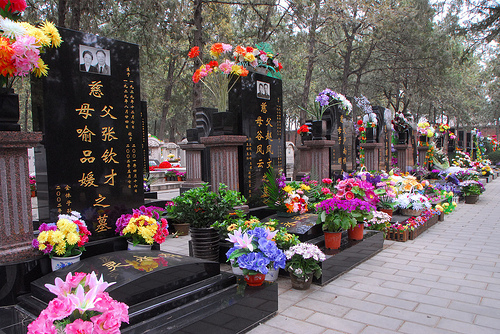 *Qingmingjie, tomb sweeping day, is a traditional holiday during which family visit their ancestors’ graves, tidying and making offerings. Although the taxi driver life is hard, not the best money or working conditions, Driver Zhao considers himself fortunate. How else would an ex-soldier from a small town meet and have a conversation with a girl from Australia? These conversations with people from all over China and the world make his life fortunate. He believes in having a positive attitude. How else can one be happy? Speaking of Australia, Driver Zhao is quite impressed with Julia Gillard (our Prime Minister). He says she’s very beautiful, and is especially taken with her nose. Her voice, too, but he made a bigger deal about her nose. He also thinks she’s done a good job for Australia, that Australia definitely has the better deal in our trade relations with China. Unlike every other taxi driver to have brought her up, though, he made no mention of her marital status or lack of children (and age). Driver Zhao expressed a great love of travel, and we happen to share the same favourite domestic travel destination – Xishuangbanna, Yunnan, in far southern China. Driver Zhao has also travelled overseas – he named Thailand and Singapore in particular. Although he felt the most important thing in overseas travel is to meet people; he thinks the scenery is basically the same!